What is the Difference Between Total Residual Chlorine and Free Chlorine? Simply put, the total chlorine concentration in a water sample includes all available free chlorine plus all the chlorine that has already oxidized (acted on) contaminants in the water and become combined chlorine (monochloramines). 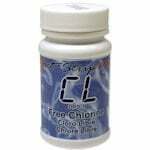 Free (available) chlorine refers to the concentration of chlorine molecules residing a water sample that have not, yet, oxidized contaminants. 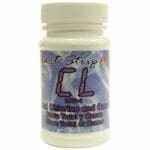 As a general rule you want to maintain a free chlorine residual in a body of water or water source. Therefore, if a water sample has a total chlorine residual but no free, available chlorine, then the sample may or may not be ‘safe’. Some public (municipal) drinking water systems use only combined chlorine Why would they do that? It seems counter-intuitive that a public water systems would choose combined chlorine over free chlorine given free chlorine’s superior disinfecting (oxidizing) properties, but monochloramines do still have oxidizing capabilities and they do not create compounds (disinfection by-products, tri-halomethames, TTHM’s, etc.) that may cause cancer. For pool water you can use a test strip like the Pool Check 6-Way to determine the free and total chlorine concentrations of a sample. For drinking water you can use test strips like SenSafe Free Chlorine Water Check to determine the free chlorine concentration of a water sample and SenSafe Total Chlorine Water Check to determine the total chlorine concentration of a water sample. 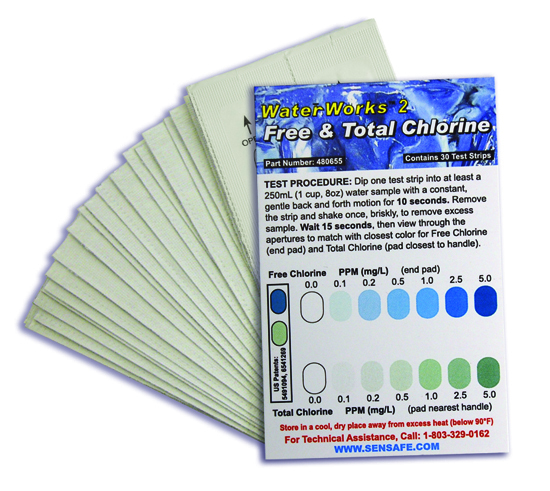 OR, for an even easier test procedure, you can use the WaterWorks 2 Free & Total Chlorine Test Strip which tests for both free and total chlorine at the same time. How Can I Check to See if My Water Filter is Working? Anyone that has taken the initiative to install a water filter or water purification device/system in their home deserves a bit of praise… and those that continue to take an interest in the quality of their water after installing a water treatment system deserve even MORE for their efforts. Unfortunately we do not have familiarity with water testing laboratories in India and cannot directly assist with this situation. We can suggest, however, that you contact your local health department and ask them for a list of certified water testing laboratories in your area. In order to know what type of filter or what filtering capabilities you should purchase, invest (yes, we said invest) in a thorough water analysis performed by a qualified water testing laboratory. Here, again, we suggest contacting your local board of health and asking them, for a list of certified drinking water testing labs. Alternatively, or if no labs exist in your immediate vicinity, you can use the services of accredited water testing companies such as National Testing Labs. No matter what, though, always have your water tested BEFORE deciding on a water treatment system. Oh, and one more thing: Don’t think for one second that a salesperson doing an in-home water test has the same water testing tools or qualifications as a reputable water testing laboratory. Remember: 99% of all salespeople attempt to sell things and not accurately analyze a situation — especially if accurately diagnosing a situation could cost them a sale! As ‘J. Mampilly’ has done, we should ALL take an interest in comparing the quality of water that comes out of our water filter systems. Only then will we know if the money we invested in (not spent on!) a quality drinking water filter system performs as expected. Testing water quality beforehand gives us not only an idea of what we need to filter out of our water, but also a checklist of water quality parameters to monitor post-filtration. Should follow up water testing reveal that these ‘issues’ did not get corrected or suddenly show up months after the installation of a water system, perhaps the water filter has stopped working or never really worked properly in the first place and needs service of some sort. Many people go through life ‘deaf, dumb and blind’ when it comes to the quality of their water — until an (initially) unexplainable health problem pops into their life. Then, and unfortunately sometimes too late, those same people get very interested in the quality of their water and want to punish or otherwise penalize others for allowing them to consume tainted, polluted and/or contaminated drinking water. Although we feel much sympathy for the victims of poor quality drinking water, most of us here in the United States have the ability to at least once every great while perform basic testing for critical water quality parameters such as heavy metals (i.e. lead, mercury, copper, iron, etc. ), coliform bacteria, pesticides (i.e. 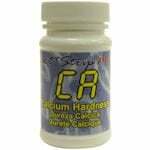 atrazine and simazine), chlorine levels (free and/or total), total hardness, total dissolved solids, and many others. Many times the contaminants in a water supply will have no taste, carry no odor and not appear before the naked eye. Only testing will alert you to their presence. Do not let a clever sales pitch or catchy marketing jingle fool you. 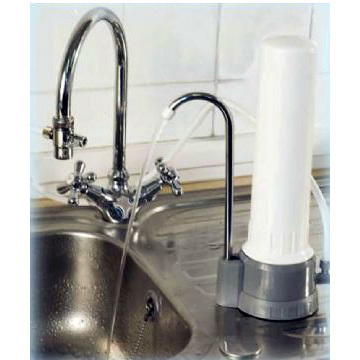 Many common drinking water filter systems do NOTHING to remove or reduce chloramines in water. They simply lack the technology in their filtration media to do so. We mentioned this filter (the Pentek ChlorPlus) in the past and now feel the need to mention it again since we continue to receive inquiries from people asking why their water filters fail to remove all of the chlorine smell from their water. The majority of water filters readily available in the marketplace do NOT remove chloramines, also known as combined chlorine. 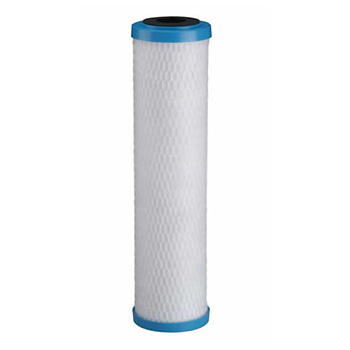 Most carbon filters remove free chlorine only. It takes a specialized type of filter like the Pentek ChlorPlus to cleanse water of unwanted chloramines. Does my water contain chloramines? Whether your municipal water system uses free chlorine or chloramines as its primary sanitizing agent we cannot say, but in either case your water will certainly contain chloramines. Unsure why? Take a look at this brief tutorial on free chlorine, total chlorine and combined chlorine. That’s just a cartridge… What sort of housing does it go in? A very keen observation followed by a very good question! The Pentek ChlorPlus filter for chloramine removal fits in most standard sized 10″ (by 2.5″) filter housings available from online retailers like Filter Water..
As always before purchasing a replacement cartridge for your water filter system, check, double check and TRIPLE check to make sure your housing will accommodate the filter cartridge you wish to buy! Thank you, John, for your question and more importantly for reminding us that we needed to examine the cost of chlorine meters at some of our favorite online merchants: FiltersFast.Com and FilterWater.Com. 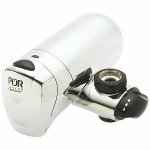 FiltersFast.Com still carries the eXact Micro 7+ Water Testing Meter and they currently sell the basic water quality kit for $200. While perusing the site we noticed that FiltersFast.Com appears to carry several of the more commonly used replacement reagentstrip bottles for the eXact Micro 7+ meter: Total Alkalinity, Bromine, Calcium Hardness, Free Chlorine, Total Chlorine, Copper, Ozone, Permanganate, pH. We saw no other chlorine testing meters available on the site. FilterWater.Com continues to carry the eXact line of water testing meters and currently has three kit versions of the eXact Micro 7+ available: Standard Water Quality for $249, Pool and Spa for $249 and Chlorine Photometer for $229. 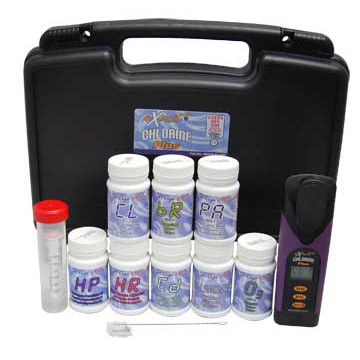 Each kit features the same meter, but comes with a different set of reagentstrip bottles tailored to meet the needs of a specific water testing application/market. In addition to the eXact Micro 7+ meter kits, we also noticed that FilterWater.Com also carries a newer eXact meter called the eXact Micro 8 Meter. That meter did not, however, appear to test for chlorine. The USEPA approves of using DPD when testing drinking water and/or wastewater for chlorine content. Therefore, we suggest you invest in a system that uses DPD for free chlorine and/or total chlorine residual testing.